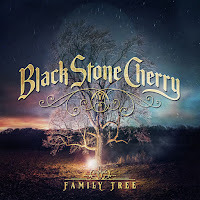 RockUnitedReviews: Black Stone Cherry: "Family Tree"
Black Stone Cherry: "Family Tree"
Family Tree is the sixth album by (blues) rockers Black Stone Cherry and in my humble opinion it belongs to one of their best so far as on this album their sound is really unique. Their music being a mix of Cream, Led Zeppelin, Muddy Waters, rock and roll, blues and rock really comes to life on Family Tree; just listen to the amazing opening track Bad Habit and you will be hooked. This new album contains 13 tracks and the musical highlights are numerous, take for example Carry Me On Down The Road (heavy rock and roll with great wah-wah guitar solos), Get Me Over You (funky Lynyrd Skynyrd-like southern rock), Bad Habit (heavy, up tempo with a bluesy guitar solo) and the title track, a mid tempo blues rock stomper with a melodic slide guitar solo. However the very best song is without any doubt Dancing In The Rain, a mid tempo blues rocker where the guitars dominate, featuring guitar legend Warren Haynes. Family Tree was sell-produced and Chris Robertson (guitars/vocals) mixed the album and this resulted into an excellent up to date blues-based rock album of the highest quality. Highly recommended, so be sure to check it out!